OH HOW AMAZING IS THIS! THIS IS AN OLD VINTAGE ALUMINUM METAL BIRD THAT LOOKS LIKE A HERON (NOT A FLAMINGO) WITH LEGS. You rarely find the old garden birds other than the flamingoes. I've never seen one like this. This is the hard to find aluminum one which is great because they won't break. Attached to his body are the metal legs. They have the stakes attached that go in the ground which are not removable. It has the original white paint which is a little chippy, with a little rust and peely for a great patina. Perfect anywhere in your garden with any shabby chic, French country, Farm House, or romantic cottage decor. Measurements are about 20" by 18" by 5" deep. It weighs about 2 pounds. THIS IS JUST FABULOUS. IT IS A HEAVY VINTAGE CEMENT BIRDBATH THAT IS A GREAT SIZE TO DISPLAY ON A TABLE OR COUNTER TO USE AS A GREAT DISPLAY PIECE. I love the vintage birdbaths and the nice garden architectural touch they add to a decor. This vintage birdbath is one piece and is cement weighing about 34 pounds. This is such a nice size and shape. It has some minor stains, dirt, discoloration and wear. You could set this on a table and fill it with a very cute display. I have it filled with a plant and porcelain roses. Sorry, my items are not included and not for sale. I can picture this with so many possibilities. How cute would this be in a bathroom or garden room, or even out on your patio or porch? It would be fabulous out in your garden filled with birdseeds or water for the birds. Great in any shabby chic, romantic cottage, Victorian or French country home. Measurements are about 11" tall by 15 1/2" wide at the top and 9" wide at the base. It weighs about 34 pounds. THIS IS AMAZING! IT IS AN OLD VINTAGE STATUE OF A CHERUB OR ANGEL WITH WINGS THAT IS PRAYING. This is made of cement and is heavy for it's size weighing about 25 pounds. The charming cherub or child is standing in a cute pose with it's hands in prayer. The statue has a nice time worn weathered patina, discoloration, a couple minor chips, a little bit of green moss, dirt and wear. Statues look awesome in any room and any décor or in the garden! Great in any shabby chic, Victorian, Antique, romantic cottage, Farm House or French country home. Measurements are about 19" tall by 8 1/2" by 7 1/2" deep. It weighs about 25 pounds. HIS IS FABULOUS! THIS IS AN OLD VINTAGE SALVAGED CAST IRON METAL GARDEN URN TOP WITH AN AWESOME SHAPE, AND A WONDERFUL CHIPPY WHITE PATINA. PLEASE NOTE THAT THIS IS THE SALVAGED TOP OF AN URN AND ALSO HAS TWO BROKEN OFF PIECES FROM THE RIM, BUT STILL HAS AN AMAZING LOOK. This is a nice size that is cast iron metal and is a little heavy weighing about 13 pounds. It has the old white paint that is chippy, crusty, crackly with paint loss, peely, rusty and time worn for a perfect patina. Again, it has the two broken pieces at the top. You can use this in your home with flowers or a plant, or fill it with shells, beaded domes or whatever you wanted to. Sorry, the items inside are not included. This would be incredible in any shabby chic, romantic cottage, Farm House or French Country home. Sorry, the items inside are not included. Measurements are about 12" tall by 13" wide at the top. It weighs about 13 pounds. 3 AWESOME OLD Vintage Metal SAP BUCKETS CANS Original White Paint GREAT LOOK! THESE ARE FABULOUS! THESE ARE THREE OLD METAL SAP BUCKETS OR CANS THAT CAN BE REPURPOSED AS A CONTAINER FOR FLOWERS OR OTHER ITEMS. These are old and vintage, and not the new ones. They are metal and all three are different sizes. They have a hole to hang them, or you can sit them on a table, as I show. They have the old white paint, and each has a number in pink, 4, 5 and 6, as they were numbered as they hung in the trees. They are a little chippy, with some minor stains, some rust, some minor dings and time worn for a perfect patina. SORRY THE PLANT AND HYDRANGEAS ARE NOT INCLUDED AND NOT FOR SALE. THIS IS FOR THE THREE SAP BUCKETS ONLY. They hold water and do not leak. This would be fabulous in any shabby chic, romantic cottage, Farm House or French Country home. Measurements are about 9 1/2" tall by 5 1/2 to 6 1/4" wide each. THIS IS FABULOUS! THIS IS AN OLD VINTAGE CAST IRON METAL GARDEN URN WITH AN AWESOME SHAPE, AND A WONDERFUL CHIPPY TIME WORN PATINA. Urns always add a nice architectural interest to a room or garden. This is made from cast iron metal and is heavy, weighing about 40 pounds. It is a wonderful size, and very shapely, with nice detailing, including the stunning handles. PLEASE NOTE THAT ONE OF THE HANDLES HAS THE ORIGINAL SCREWS REPLACED WITH NEW ONES. It has the old paint that is mostly rusty that is chippy, with paint loss, peely, rusty and time worn for a perfect patina. It has a drainage hole at the bottom. You can use this in your home with flowers or a plant, or fill it with shells, beaded domes or whatever you wanted to. Sorry, my plant and beaded dome are not included. Don't let this one get away! This would be incredible in any shabby chic, romantic cottage, Farm House or French Country home. Sorry, the items inside are not included. Measurements are about 11 1/4" tall. It is about 23" handle to handle and 14 1/2" deep. It weighs 40 pounds. THIS IS AN OLD VINTAGE METAL WATERING CAN WITH A PERFECT TIME WORN PATINA AND UNIQUE SHAPE. I'm not sure if this originally was a watering can, or used for something else, but it does make a great watering can. It is a cute size and shape. It has some discoloration, stains, minor dings, a little rust and wear. Perfect to use inside with flowers. Measurements are about 12" from end to spout by 8" deep and 6" tall. THIS IS A FABULOUS OLD LAVABO, WALL FONT, WALL PLANTER OR WALL FOUNTAIN THAT IS CAST IRON WITH A GREAT PATINA. This is an older piece that weighs about 25 pounds. The wall fountains like this one are so hard to find and look fabulous in a garden, on a porch or patio. It has the old original white paint that is now chippy, peely, and crusty with some rust for a nice shabby patina. It has a hole at the top to hang. Sorry, the plant is not included. Perfect with any shabby chic, French country, Farm House, or romantic cottage decor. Measurements are about 29" tall by 17" wide and 10" deep. It weighs about 25 pounds. THIS IS FABULOUS! IT IS A VINTAGE GARDEN CEMENT STATUE OF A CHERUB WITH WINGS IN A CUTE POSE. This is a little heavy weighing about 32 pounds. It is made of cement. The cherub has a pretty faces and in a nice pose. There are a couple minor chips as I show to nose and chin and a little hole on the cheek The statue has the original gray with chippy paint, a few minor chips, discoloration, some garden stains, minor dirt and wear. Statues look awesome in any room and any décor or in the garden! Great in any shabby chic, Victorian, Antique, romantic cottage, Farm House or French country home. Measurements are about 20" tall by 10" wide and 8" deep. It weighs about 32 pounds. THIS IS INCREDIBLE! THIS IS AN OLD VINTAGE CAST IRON GARDEN URN WITH AN AWESOME SHAPE, AND THE OLD WHITE PAINT WITH A WONDERFUL PATINA. Urns always add a nice architectural interest to a room. This is made from heavy cast iron metal. It has the old white paint that is chippy, with paint loss, peely, rusty, with crusted dirt and time worn for a perfect time worn patina. You can use this to make a statement in your home with flowers or a plant, or fill it with shells, beaded domes or whatever you wanted to. Or you can use it in your garden. Don't let this one get away! This would be incredible in any shabby chic, romantic cottage, Farm House or French Country home. Sorry, the items inside are not included. Measurements are about 20" tall. It is 15" by 15" at the top and 8 3/4" by 8 3/4" at the base. It weighs a total of 45 pounds. THIS IS INCREDIBLE! THIS IS AN OLD VINTAGE CAST IRON FRENCH GARDEN URN WITH ORNATE DETAILING, AN AWESOME SHAPE, FANCY HANDLES AND A WONDERFUL PATINA. Urns always add a nice architectural interest to a room. This is a very hard one for me to let go of, since urns are one of my favorite items to display in our home and garden. This is an older urn from France of good quality. This is made from heavy cast iron metal. It has an incredible shape with a fluted body and with the very ornate fancy handles that also has the beaded details. It has a drainage hole. There is writing on the bottom, but I can't make it out. It has the old silver or gray paint that is chippy, with paint loss, peely, rusty and time worn for a perfect time worn patina. You can use this to make a statement in your home with flowers or a plant, or fill it with shells, beaded domes or whatever you wanted to. Don't let this one get away! Measurements are about 16" tall. It is 17 1/2" wide from handle to handle. It is about 14" deep. The opening is about 8 1/2" wide and it weighs about 30 pounds. 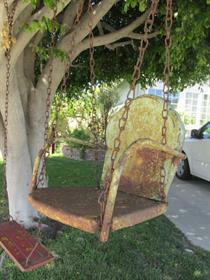 CHARMING Old Vintage CHILD'S GARDEN METAL SWING with Hanging Chain Just Adorable! THIS IS JUST ADORABLE. IT IS A VERY CUTE CHILD'S GARDEN METAL SWING WITH CHAIN. This is very cute and full of charm! This has the cutest shape and is metal. The original rusty chain is included. It has the original green paint that is chippy, rusty, with paint loss, scratches, and wear for a great patina. There are a couple minor dings and minor breaks in the metal. Measurements are about 14" tall, by 13" wide and 13 1/2" deep. With the chain it is about 40" long. THIS IS INCREDIBLE! THIS IS A LARGE STATEMENT MAKING OLD VINTAGE BIRD CAGE BIRD HOUSE WITH AN INCREDIBLE LOOK. This could very easily be a keeper. It is an awesome folk art bird cage birdhouse that is make out of wood, wire and metal. The house is build over the birdcage. It is two stories, with windows and doors that open. It has a porch railing and so many awesome details. One side is completely open as I show. You could add a fern or other plant inside if you wanted to thru this opening. Some of the porch rails little pieces are missing. The roof is metal. It has the original white paint with green accents that is chippy, with paint loss, peely, rusty and time worn for a perfect time worn patina. You can use this to make a statement in your home or garden. Don't let this one get away! This would be fabulous in any shabby chic, romantic cottage, Farm House, Jeanne d'Arc Living or French Country home. THIS IS FOR THE BIRDCAGE HOUSE ONLY. Measurements are about 28" by 22" by 17". It weighs about 18 pounds. 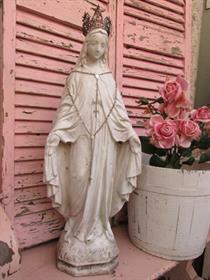 THIS IS A FABULOUS OLD VINTAGE CEMENT GARDEN STATUE OF MADONNA WITH A CHIPPY WHITE PATINA THAT IS PERFECT FOR YOUR HOME DECOR. THIS IS FOR THE STATUE ONLY. THE CROWN AND ROSARIES ARE NOT INCLUDED. This is cement and a little heavy weighing about 36 pounds. It is a nice size to display both indoors and outside. It has the original white paint that is chippy, peely, with paint loss, with minor dirt and wear for a nice patina. I show a close up, on the neck where you can see a little of the metal rod underneath. his has a very nice French look to it. Perfect in any shabby chic, French cottage, Farmhouse, or Jeanne d'Arc Living decor. Measurements are about 25" tall by 10" by 6". It weighs about 36 pounds.